A Girl for All Time’s initial quartet. It’s hard to be an Anglophile in July. Honestly, any other month of the year, and it’s all “tallyho” and “hip, hip, hooray.” But come the month that honors America’s severing of the old maternal apron strings, and it feels downright traitorous to declare that you are a fanatic for Jane Austen and Charles Dickens drives you mad. Really, it’s a month when declaring one’s dependence on British mystery movies and costume dramas makes you feel … well … out of step with the rest of the States. That’s why the doll lineup, called A Girl for All Time — hailing from the United Kingdom — is such a fabulous compromise. 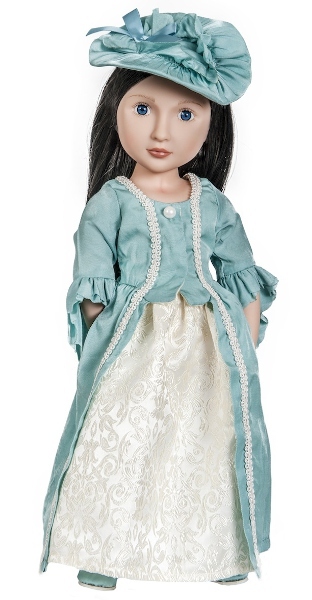 Yes, the dolls are England’s version of our American Girl series, but it’s done with a British national twist. The dolls follow the ancestors and descendants of a family’s lineage, and since the girls are part of the UK’s historical fabric, they have a much larger and longer tapestry to draw from. Matilda, the girl from the Tudor times. 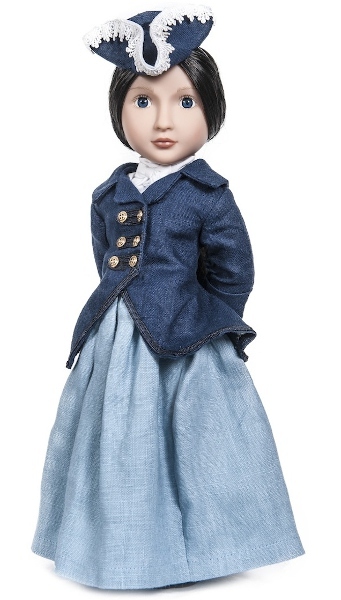 Popping up amid this nearly 500 years of a country’s destiny are also dolls from World War II (Clementine, who really embodies “carry on and remain calm” attitude of the late 1930s and 1940s) and the perennially popular Victorian age (1837 to 1901). Interestingly, the dolls’ creator (their imaginative mum who birthed them) is an entrepreneurial businesswoman named Frances Weeks Cain. 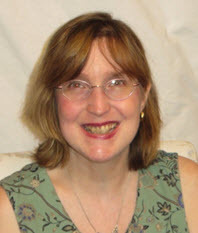 She dreamed up the dolls and their fictional lifetimes as toys for her own 10-year-old daughter, who at the time was desperate to find a doll-and-book combo that she could relate to. Clementine in her party dress. Because the UK and the US have had such an intertwined and long-standing relationship (on Facebook, our status would be “complicated”), some of the dolls do have American crossover anecdotes. 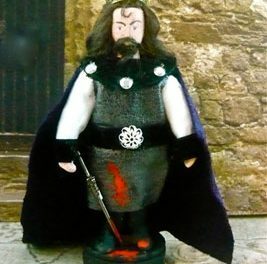 Even though these are dolls who were designed to salute the Union Jack and kneel to the monarchy, their conjured-up familial tales touch upon America, both in its Colonial infancy and in its more modern, groovy adulthood. 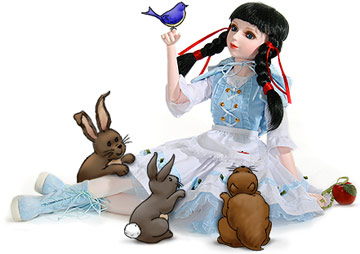 The doll that actually counts America — Massachusetts, Boston and Plymouth — as her home turf is the Georgian Girl, Lydia. Lydia’s biography entails her and her family’s maritime voyage from Bristol, England, to the wild shores of the Massachusetts colony. Lydia Peyton resides in the Colonies, pining for her more refined and civilized life in Great Britain, in the year 1760. She’s a traveler to the so-called New World (now America’s Eastern Seaboard) and she has to adjust to a society that is rougher, less educated, and more dangerous. Lydia in her 1760 party dress. In 1760, the Boston Tea Party is still 13 years away, and any undercurrents of revolution and rebellion are just that — stifled and not fervently discussed. Lydia is living in the American Colonies when Washington is still a loyal subject to the king and crown. In fact, 1760 is when the colonists are involved in the French and Indian War, which languished from 1754 to 1762. The American colonists battled on behalf of the British monarchy and their territorial claims against the encroaching and grabbing French. Lydia in her riding costume. That’s what is so unique about this Cain chronicle of her dolls and their descendants. 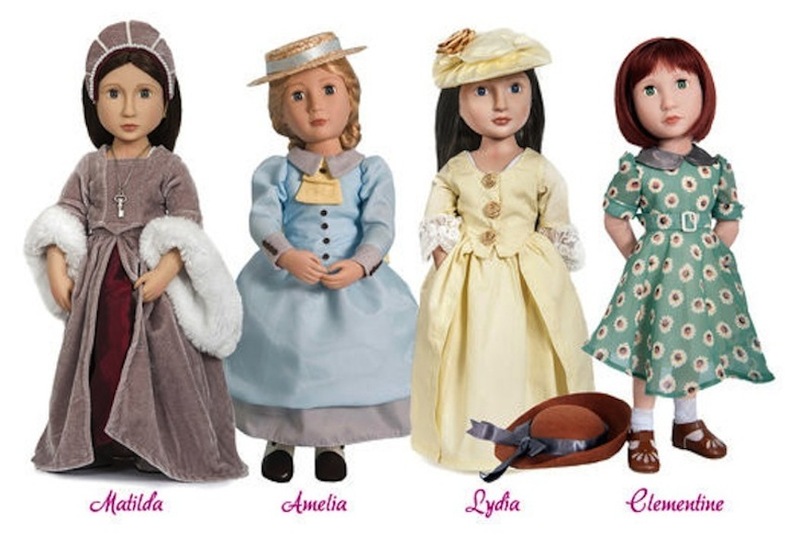 The dolls have their DNA melded with the DAR (Daughters of the American Revolution). Beyond the faraway history of the 1700s — to us, that is so, so, so long ago; for the Brits, it is recent history, not ancient at all — Frances Cain has her 1960s Girl for All Time take a psychedelic stroll onto the streets of New York City. Samantha Liron lives with her family in Paris, France, and dreams of blossoming into a world-famous fashion designer. When her family faces financial ruin from a bad investment, Samantha heads off to Manhattan, to live with her quirky and fun-loving uncle Ernie. Growing up in Greenwich Village during the culture clash of “squares” and “free spirits,” Sam absorbs everything she sees and hears and experiences. She’s a sponge that will take her new stimuli and, like fashion guru Tim Gunn always advises, will make it work in her studio. Sam, garbed in her swinging 1960s styles. The clothing for the doll line has always been lavish and award-winning. One of the reasons why is that Cain has made sure to hire the best in order to unleash the best. Among her collaborators have been Katya Wildman (a high-profile, successful London fashion designer), Hollywood costume creator Caroline Harris, and Thimbles & Acorns, doll-wardrobe duo extraordinaire. Clementine works the land in her can-do ensemble.